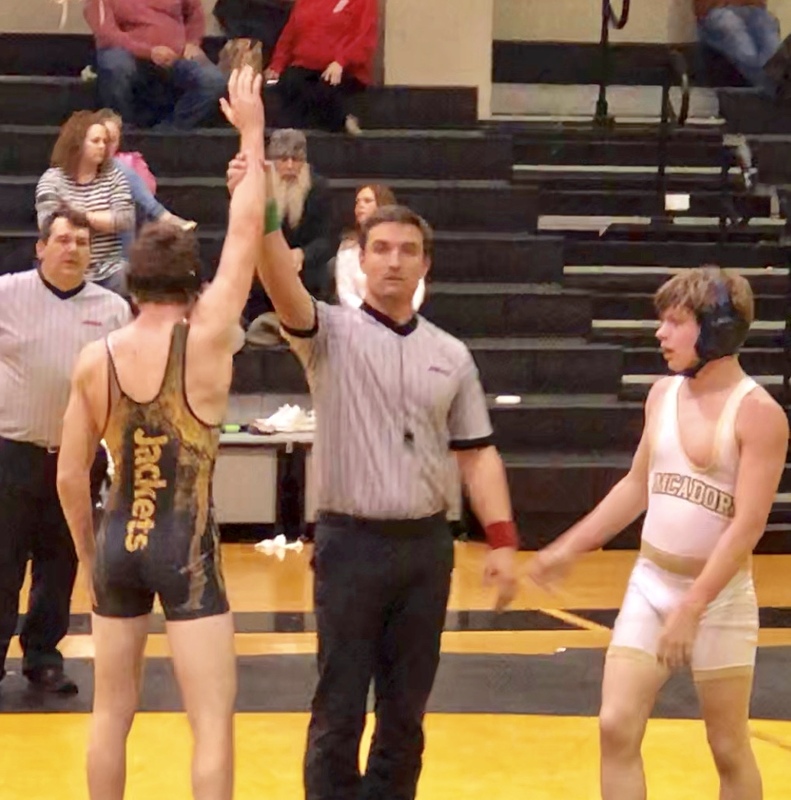 McCALLA – Oxford wrestling coach Kyle Routon knew if his Yellow Jackets were going to have any chance to advance to the State Duals semifinals they would have to have success in three particular matches – 113, 126 and 182. If the Jackets could at least take two of the three Routon felt good about his team’s chances. Oxford’s Reed Hill (L) is confirmed as the winner in his 152-pound match against McAdory’s Jacob Champio. The Jackets did better than that. They won all three bouts and went on to beat host McAdory 39-32 to reach the 6A Duals semifinals for the third year in a row. Of course, they won the title each of the last two years. At 113 Kaleb Shelton bounced back from an early takedown to win a 6-2 decision over Hudson Waldrop. Landon Burrage won a 14-5 major decision over Donald Phillips at 126. And at 182, Keeshon Siaosi won an injury forfeit over Nickolans Pate in a match he was leading on points when it ended to put the Jackets over the top with four bouts remaining. The Jackets dominated the middle of the card, getting a major decision from Chase Hicks (138), tech falls from Jakob Chisolm (145) and Kendrick Young (160), and pins from Reed Hill (152) and Tristen Latham (170) before getting to Siaosi. Oxford handled Northridge in its first match 68-9. McAdory earned its spot in the second round by taking out Benjamin Russell 51-27. The Jackets now await the winner of Friday’s matches at Spanish Fort. 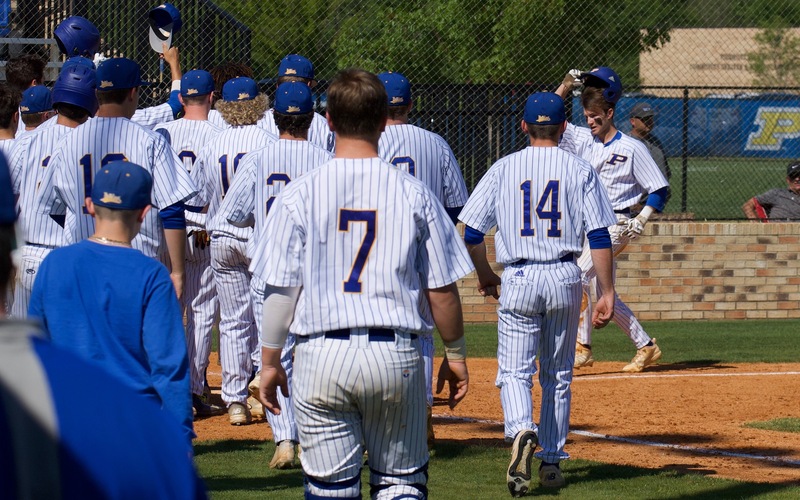 Those teams are Stanhope Elmore, Spanish Fort, Gulf Shores and Wetumpka. In the 1A-5A tournament, Alexandria fell short of the semifinals, losing to Hayden in the second round 39-36 when 2018 state placer Ty Judd pinned first-year wrestler Connor Norris in the final bout of the match (145). The Valley Cubs took out Moody, a region champion, in their opening round match 39-33. Ranburne will host Cleburne County for their trip to the 1A-5A semifinals – a Cleburne County Cup, if you will – Saturday at 3 p.m..
106: Peter Henderson (M) dec. over Garrett Howell, 10-2. 113: Kaleb Shelton (O) dec. over Hudson Waldrop, 6-2. 120: Brody Earley (M) pinned Kash Hornsby, 1:31. 126: Landon Burrage (O) maj. dec. over Donald Phillips, 14-5. 132: Steven Bell (M) maj. dec. over Wesley Slick, 11-2. 138: Chase Hicks (O) maj. dec. over R.J. Lawhorn, 20-8. 145: Jakob Chisolm (O) tech fall over Joshua Wesson, 15-0. 152: Reed Hill (O) pinned Jacob Champion, 3:18. 160: Kendrick Young (O) tech fall over Marvin Barrera, 19-2. 170: Tristen Latham (O) pinned Carson Roberts, 1:20. 182: Keeshon Siaosi (O) over Nickolans Pate, inj. 195: Turner O’Brian Black (M) pinned Octavius Adair, 2:27. 220: Adam Portillo (M) pinned Kobe Shumaker, 5:29. 285: Rasheed Todd (M) pinned Jalen Bradford, 0:23. 106: Bentley Brisoe (H) pinned Preston Jones, 5:07. 113: Evan Phillips (H) pinned Joseph Lomax, 5:31. 120: Aden Whittaker (A) pinned Andrew Phelps, 0:48. 126: Fletcher Swindall (A) pinned Ryan St. John, 3:03. 132: Jaden New (A) pinned Jeremy Phelps, 0:53. 138: Kaleb Burford (H) dec. over Dakota Medders, 12-10. 145: Ty Judd (H) pinned Connor Norris, 1:00. 152: Michael Brubelow (H) pinned Brock Thrash, 0:41. 160: Colby Hallmark (H) pinned Krystyn Boles, 0:30. 170: Scottie Poore (A) dec. over Christian Wiley, 9-4. 182: Linus Piper (H) pinned Grady Tranthum, 2:46. 195: Connor Hall (A) dec. over Trevor Reno, 9-6. 220: Christian Knop (A) pinned Dylan Chappel, 0:11. 285: Skyler Payne (A) won by forfeit.